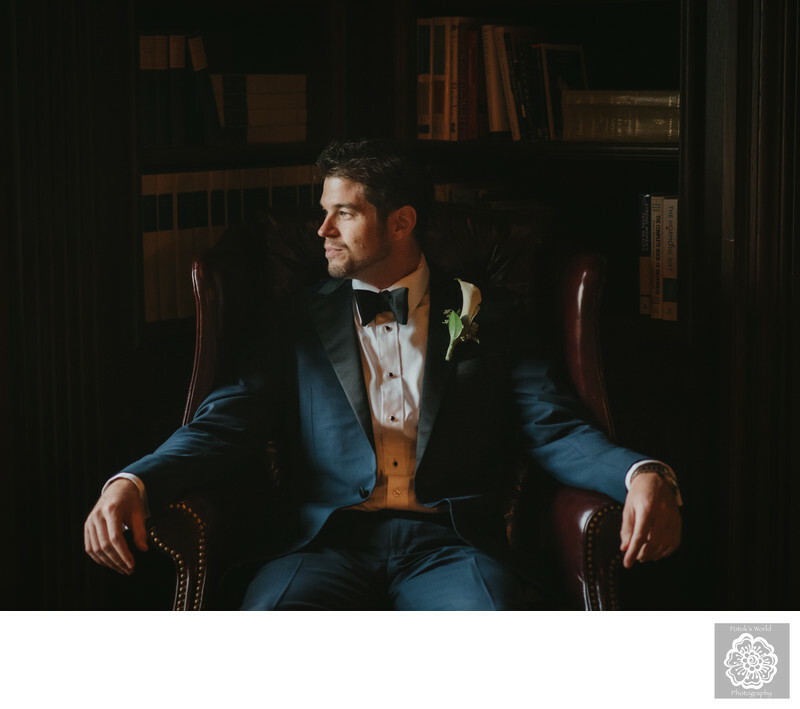 When it comes to settings for creating great portraits of a DC groom, we are suckers for old libraries. As DC wedding photographers, we feel that a location like that is ideal for portraiture of grooms. It generally has all the elements we need to capture images they and their future spouses will treasure forever. For starters, rooms with warm, oaken walls and heavy, comfortable furniture look elegant and luxurious. Any portraits a Washington, DC, wedding photographer takes in such a venue appear to be set in an opulent mansion. There is also something about an old library’s color scheme that works well in portraits of men. Most grooms wear neutral-colored suits or tuxedos for their nuptials. A bright and colorful background can sometimes draw attention away from a man clad in darker tones. Taking portraits of grooms in more understated venues can help keep the focus of the image where it belongs. In addition, the lighting in an old study in a Washington wedding venue is frequently conducive to unforgettable groom portraits. Because their walls are mostly wood, libraries tend to be fairly dark when the lights are turned off. They do often have large windows that can let in a lot of sunlight. But these rooms usually also have heavy drapery that can be used to adjust how much light gets in. Having that control over the source and intensity of light sources is a godsend for DC wedding photographers like us. It means we can make the lighting do more or less exactly what we want. And that can lead to some dramatic portraits — like the one of the Washington-based groom featured here. We took pictures of him in the luxurious old library of the Salamander Resort & Spa in suburban Northern Virginia. There are a couple of things about this particular photograph of a DC groom that we think sets it apart. The first is the aforementioned dramatic lighting. To set up the shot, we had the groom-to-be sit in a chair near the window. We did not want him to be right next to that opening to the outside. It is likely that the light there would have been too strong. We wanted the groom to be illuminated but not blown out. We wanted some definition in his suit and the books behind him, but for the features of his face to be prominently visible. You can see in this image that we succeeded in achieving that goal. The other element that makes this portrait at the Salamander Resort & Spa work so well is the posing. Grooms in the Washington, DC, metro area are often nervous before their marriage ceremony. Because we do not want that emotion to be present in their portraits, we strive to find poses that help them relax. Any Washington, DC, wedding photographer knows that sitting is a great way to reduce the tension in a subject’s body. Standing can help a groom look tall and powerful, but it looks awkward if the subject is stiff and unsure. A groom in a seated position can look calmer and more self-possessed, provided that he does not slouch excessively. The last part is especially true when the chair in question is big and comfortable. In those cases, the piece of furniture can appear to swallow the subject, making them appear small and somewhat weak. To avoid that outcome, we had the groom pictured here pull his shoulders back and put his hands on the chair’s armrests. The first tweak helped keep him from sinking into the upholstery. The second made him take up more of the frame, giving him a more powerful and confident air. The combined effect of these two elements of posing was a portrait in which the groom seems calm and contented. He looks like a man who is exactly where he wants to be at that moment — minutes away from marrying the love of his life.